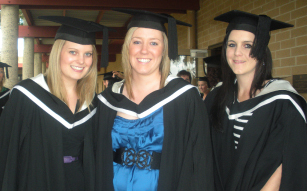 Some Federation University Australia partner providers hold graduation celebrations overseas. Students should contact the School they studied at for further information. Ballarat is approximately 1 and 1/2 hours drive from Melbourne airport. If you are flying to Melbourne, please allow sufficient time to travel from the airport to Ballarat - this can vary between 75 minutes and 90 minutes, depending on road/traffic conditions. If your ceremony is scheduled for 10.30am, registration opens at 8.30am, and you may like to consider flying in the night before your ceremony, to avoid unnecessary pressure if delayed. Transport from Tullamarine Airport (Melbourne) is the easier option as there is a direct shuttle between the airport and Ballarat. 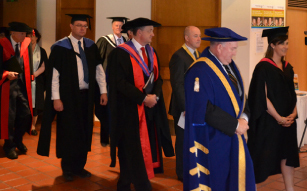 A standard graduation ceremony will run for approximately 60 minutes. However, graduates need to register and collect their academic gown before the ceremony and should allow appropriate time for photographs etc. Times for registration and robing will be provided in the information confirming graduation attendance details, sent to you approximately 4 - 6 weeks before the ceremony. You should also allow time to return your academic gown after the ceremony. Smart casual dress is suggested if you are graduating. (Please be aware there are stairs on either side of the stage). The attendance fee includes 2 guest tickets. Extra guest tickets may be purchased for $15 each, if available. If tickets are available, you will be notified by email after numbers have been finalised. Graduates do not require a ticket. Tickets will be sent electronically when you submit your graduation attendance details online via Reed Graduation Services portal. An email will be sent to advise you when this portal is open. Please ensure your guests have a copy of their tickets when they attend the ceremony. Graduation car parking is available off East Terrace, Federation University Australia, Mt Helen. A public car park is situated directly behind the Horsham Town Hall and can be accessed by either Wilson or Pynsent streets. There is also plenty of street parking available. Graduation car parking is available off Mary Grant Bruce Drive, Federation University Australia, Churchill.